Why should I care what tier I'm in? In Chicago, a student's chance of getting into the city's top, selective high schools depends on where they live. Chicago Public Schools (CPS) places every part of the city into one of four socio-economic "tiers." On average, people from Tier 1 areas make less money and have less education, and people from Tier 4 areas make more money and have more education. This tool helps you find what CPS tier you are in. This site was launched in 2012 and we have updated the tiers (yes, they change every year) ever since. In 2015, Derek Eder wrote about why we built this site and how we update the data. 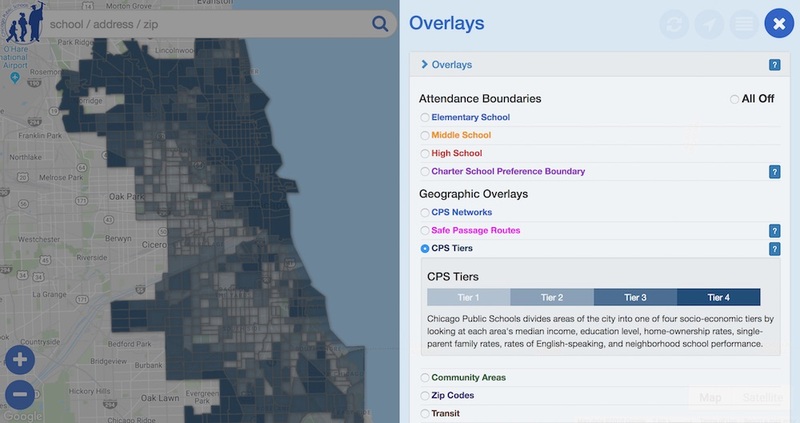 In 2016, Chicago Public Schools added their own tiers layer to the official School Locator Map, which allows you to search for your tier by address like our site does. We are happy that this site influenced CPS to make the tier lookup process easier for parents! Now, on to what the tier system is and how it works. There are four types of schools in the Chicago Public School system: neighborhood schools, selective schools, magnet schools, and charter schools. Neighborhood schools must enroll any student who lives within their boundary. Every student has a neighborhood school they can go to. Tiers don't matter for enrollment. Selective schools, which admit students from across the city, are different. Students must apply to them, and no one is guaranteed a seat because of where they live. Most of the seats are filled through the tier system. Magnet schools are in between: they admit students within their boundaries based on a lottery. Any leftover spots are opened up to students citywide based on the tier system, much like a selective school. So nearby students are not guaranteed a seat, but they have much better chance of getting in. Charter schools set their own enrollment policies. That's because selective schools use admissions quotas: Chicago Public Schools requires the schools to reserve an equal number of spots for students coming from poor and wealthy neighborhoods. If schools didn't do this, students from well-off places would be admitted in disproportionate numbers, because they tend to have better admissions scores. Rightly or wrongly, the quota tries to keep wealthier students from dominating selective schools. The result: a high-achieving student from an impoverished area has a better chance of getting into a selective school than a similar student from a richer area. For more more details, see the tier calculation page. To see if you tier changed between 2012 and 2013, see the tier differences page. Here's how it all works: Chicago Public Schools places every part of the city into one of four socio-economic 'tiers'. They do this by looking at each area's median income, education level, home-ownership rates, single-parent family rates, rates of English-speaking, and neighborhood school performance. A quarter of students are supposed to live in each tier. On average, people from Tier 1 areas make less money and have less education, and people from Tier 4 areas make more money and have more education. The following table shows what the average area looks like for each Tier. It is based on data from the 2010 American Community Survey. For a more detailed look at how tiers are calculated, see the tier calculation page. First off, it's important to understand that only 70% of the spots at selective schools work on the tier system. Schools give 30% of the seats to their highest-performing applicants, regardless of where they live in the city. The students that fill these city-wide seats tend to live in wealthier, more educated parts of town. Each year, selective schools fill their tier seats by looking at applicants from each Tier in isolation, and offering enrollment to the top students within each Tier. Consider Lane Tech College Prep, a prestigious selective enrollment high school on the North Side. In the 2012-2013 school year, Lane Tech had 1000 seats to fill. The school gave 300 seats of the seats to the highest scoring applicants, leaving 700 tier seats. Lane Tech filled these seats by offering enrollment to the top 175 Tier 1 students, the top 175 Tier 2 students, and so on. A student applying for one of these 700 tier spots only competed with kids living in similar neighborhoods - not against every applicant in the city. This means that a kid from a poorer neighborhood could get into a selective high school with a lower admissions score than one from a richer area. For Lane Tech, the top 175 students from wealthier Tier 4 areas had scores between 839 and 861, while the top 175 students from poorer Tier 1 areas had scores between 737 and 856. Every year, different selective schools will have different cutoffs. But the basic idea is the same: to ensure that students from disadvantaged backgrounds have a shot at getting into the city's top schools, and to make sure these schools have economically diverse student bodies. There are a couple more small wrinkles, but that's pretty much how it works. At least as far as we can tell. CPS updates the Tiers yearly. As of 2017, this information is released on their School Locator tool. Before 2017, this data was released as a series of PDF documents that ties every census tract in the city to its Tier for the 2017-2018 selection process. We took this data and combined it with the most recent census tract boundaries provided by the City of Chicago. You can follow the steps on how this map was created in The labor required to keep civic apps alive by Derek Eder on the Chi Hack Night blog. Download our CPS Tiers map and data from Google Fusion Tables here. CPS also produced its own, static map of the Tiers, available here. Students can only apply to up to six selective high schools. If they're not accepted by any of those six, they're out of luck. Every school changes its cutoff score - the minimum score students need to get in - every year. Still, knowing the previous year's cutoff scores can help guide a student's decision of which six schools to apply for. The thing is, each school has a different cutoff score for every tier. So it can be helpful to know what tier you live in when figuring out which six schools to apply to. This map was built using jQuery, Google Maps, and Google Fusion Tables. The code is open source and free to fork from github. Our data is also open source. View and download it from Fusion Tables: 2011 Tiers, 2012 Tiers, and 2013 Tiers. Interested in using Fusion Tables to build quick and easy to use map apps? Check out Derek's template. Although we got all the data from the city, we are not an official source for looking up your Tier. For that, go here. In 1980, Chicago Public Schools and the U.S. Department of Justice signed a consent decree to desegregate the school system, overseen by the U.S. District Court. To carry it out, CPS adopted a racial quota system to govern enrollment in selective schools. In 2009, U.S. District Judge Charles Kocoras ended the consent decree, so that CPS could no longer use a student's race as an admissions factor. The Chicago Board of Education, which oversees CPS, quickly adopted the Tier system as a new way of creating social and economic diversity in the city's selective schools. For the selective high schools, admissions scores are a combination of a student's 7th grade reading, math, science, social studies grades, ISAT/NWEA scores, and an entrance exam. CPS's official policy for admission into magnet and selective schools goes into excruciating detail about how Tiers are calculated. According to Katie Ellis, director of access and enrollment for Chicago Public Schools, "We try to make sure that there's 25 percent of school-aged children in each tier." An Open City project by Derek Eder, Forest Gregg and Juan-Pablo Velez.